From designing awesome makeup bags and pouch, Tory Burch will be joining other fashion designers footsteps to launch her own beauty products. There is no official press release or any news yet from the Tory Burch office. However, like the Tom Ford Beauty line, the products from the Tory Burch Beauty are developed by parent company Estee Lauder. It is set to launch in October 2013, again, no official confirmation yet. One thing that is confirmed, the Tory Burch eau de parfum is now available. The notes comprised of neroli, grapefruit, cassis, bergamot, peony, tuberose, jasmine sambac, vetiver, and sandalwood. I haven't try it yet, but I can imagine how good it smells to combine peony, bergamot and jasmine all together. I'm a big fan of peony, you should know by now. Do take your time to visit the nearest perfume counter for a sniff. 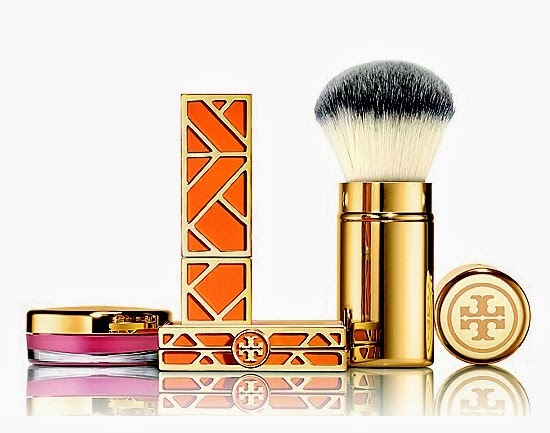 Since the entire Tory Burch Beauty line is not yet available in the market, I don't really have any constructive opinion to share. But the packaging is to die for!!!! I simply love the double T logo! The color combination of orange and gold makes them look so chic. It reminds me of YSL for some reason. I will definitely purchase it for the packaging. What do you think about designers coming up with their own makeup line? Will you purchase from these brands? Or do you think it is just a branding gimmick?